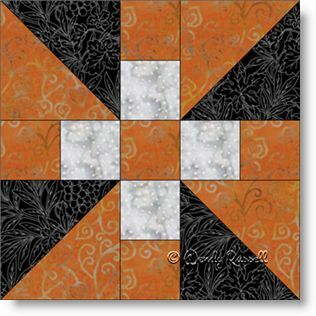 The Propeller quilt block can be used as a starter block for beginner quilters, because it contains only simple shapes -- the square and the most commonly used shape (other than the square) -- the half square triangle. For those who like easy math, this quilt block is designed as a10" block rather then the more commonly used 12" blocks. However, I have included measurements for a 7 1/2" block as well as a smaller 5" block, so you have your choice. The quilt block is constructed as an uneven nine patch as all rows are not identical in size. The sample quilts illustrated show a straight set layout as well as an on point layout. By adding extra plain blocks you can extend the size of your quilt and also make interesting designs, as evidenced in the on point setting.